Raise your hand if you love a scratch off card! I mean really, who can resist? There is something so exciting about scratching them off, isn't there? Here is an easy way to bring that excitement (minus the gambling of course) into your therapy room or classroom! All you need is acrylic paint (preferably metallic to give it the authentic scratch off feel), dish soap and clear contact paper. Mix 2 parts acrylic paint to 1 part dish soap. Stir. Paint a coat of the mixture on the contact paper. Repeat 2 more times until you have 3 coats of paint. 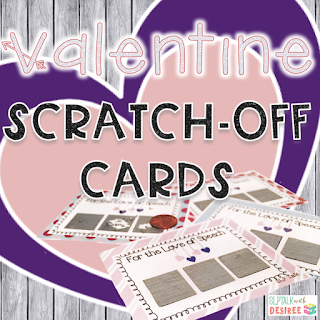 Next, simply cut your new scratch off stickers to size to fit over the area that you need them for and stick them on the laminated surface. Once the scratch off is used, you can either peel off the contact paper or place another scratch off sticker on top of it to reuse it again. I love to use mine on Valentines each year. The Valentines have three scratch off squares on each card. Two of the squares have a cute saying and the third square has a number (either 1, 2, or 3). After earning their cards, the students get to select a Valentine prize from the drawer associated with the number on their scratch-off card. I do not use a prize box in my room, so this is an extra special treat that they look forward to. tangible reward cards such as Lunch with the SLP/teacher, Free Homework Pass, etc. Context Clues- What word would fit in the sentence? You can find the Open Ended Valentine Templates as well as the drawer labels that I made here or by clicking on the image below. If you like this activity, you may also like this Speech Hearts Base Ten: Articulation Challenge. You could actually use the scratch off stickers on these too!